The leading supplier of change machines to the Italian gaming market – VNE – once again presented a whole world of change machine innovations over their large stand at the Enada Roma that took place between 17th and 19th October. The ‘Ferrari’ of the change machine industry, VNE, once again underlined why the company has grown to lead the market in the space of a few short years. The excellent quality, exquisite design and real-time after sales service continue to convince operators to look to VNE for their change giving solutions. There were indeed plenty of solutions on display. One of the first things that visitors this year noticed on the VNE stand was the colour harmonisation. The VNE change machines have now been colour branded and the black / grey combination makes VNE change machines stand out even more in the crowd. The motto ‘security – simplicity – service’ well characterises the product range and philosophy of VNE. 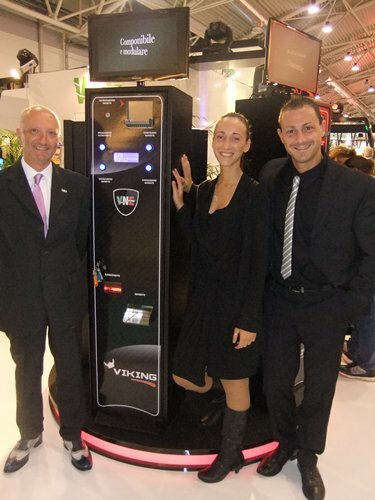 The new Viking change machine weighs 150 kg – over almost three times the standard change machine weight. The double steel protection in the front door and the multitude of heavy-duty locking hooks explain this additional weight. Looking inside the Viking, the term simplicity hits the observer. The components are all well placed in a modular fashion. All cables are well fastened away from reach. The reason why VNE stands out so much – the focus on quality – is simple to see. The highest quality components are used – for example the banknote recycler Bill-to-Bill 200 from Crane (CashCode) or the Merkur Dispenser 100 from Merkur Gaming. Customers may also choose to implement a bank note reader instead. Looking at service: The online monitoring and supervision of all VNE change machines makes the operation of VNE products viable anywhere around the globe. VNE offers full online support in real-time. Operators can thus see in real-time the transactions and any possible technical queries of all their VNE change machines regardless where they are in use. This information can be passed on to the VNE support team – guaranteeing the best possible uptime of change machines. VNE change machines can be operated as a marketing tool due to the new possibility to place a TV screen over each change machine. Operators can use the screen for advertising / information or entertaining purposes. The evolvement of change machines is well demonstrated by the new Two Pennies change machine, designed specifically for the UK 2p change market. The large touchscreen also can be used for advertising / information or entertaining purposes. Two Pennies can also play music as it has integrated loud speakers. Today a change machine from VNE is not just an ultra-secure change machine – it is a point-of-sale device, a juke box, an advertising medium. Operators get so much more from VNE. Naturally, the Two Pennies has an extensive two pence coin capacity at approx. 18,000 coins. Returning to the local Italian market, VNE introduced a commercial innovation as well – the ‘Rent Project’. Operators can now rent VNE change machines for a fixed monthly sum that includes all online, real-time service. This was particularly welcomed by operators in Italy who need to manage their business very leanly in times of economic crisis. Mr. Lorenzo Verona, Commercial Director of VNE explains, “We think that in this particular economic period it is important not just to offer products but several services: from maintenance of peripherals to online connection of machines for a remote control of money inside the cashbox”. The ENADA Roma was once again a resounding success for VNE and VNE continues to lead the Italian change machine market. International interest and success for this exceptional company is on the rise as well. The Gauselmann Group and its long-time partner, Spanish gaming equipment producer and operator José Luis Gonzales, have founded the subsidiary ‘Merkur Gaming Mexico’ with headquarters based in Mexico City. The Gauselmann Group holds 51 per cent of the company. The goal of the new company is to further develop the jointly operated network of gaming machine installations, which currently numbers more than 1,000. In the process, the company intends to expand significantly its current presence in the Mexican casino market. Management Board member Thomas Niehenke (COO) confidently stated that, “given the current volume of about 120,000 machines, the potential for 250,000 machines is realistic in this growing market, without a doubt.” Moreover, the company also intends to use the Mexico location as a base to serve the neighbouring casino markets in Panama and the Caribbean. “We are certain that we will be successful since we are working with Senor José Luis Gonzales, who has invaluable experience in these markets as a manufacturer and operator. Not to mention our outstanding gaming systems development. Our joint appearance at the ELA casino trade fair in Mexico this May is clear evidence of this potential for success”, Thomas Niehenke adds. All machines for these new markets are to be produced in the Gauselmann Group’s Lübbecke production facility, a critical contribution to the long-term preservation of jobs in the Minden-Lübbecke district. The European Casino Association (ECA) welcomes the Communication “Towards a comprehensive European framework for online gambling” presented yesterday evening by the European Commission, as it clearly outlines the Commission’s plan of action to effectively supervise and tackle the consumer protection and fraud issues linked to online gambling. Due to the lack of direct contact between the consumer and the operator and the potential danger of developing a gambling problem linked to the omnipresence of the games on the internet, online gambling presents its own particular set of risks. Internet gambling is also clearly more vulnerable to criminal activities and a higher risk of fraud. With this Communication, the Commission’s key goals are to help the Member States to effectively regulate online gambling in line with their own national traditions but also in compliance with the European Treaty, and to effectively protect consumers and citizens. The ECA looks forward to proactively participating in this process, particularly as the traditional land-based casinos have extensive experience in complying with strict national regulations and obligations. Mr. Goudsmit also expressed his growing concern about the illegal gambling activities across the Member States, stating that “illegal operators must be stopped, as it is inadmissible that so many online operators, some even based in the EU, continue to operate illegally in other European countries without a valid license. This while EU case law makes it so clear that every operator needs a valid national license in order to operate legally, be properly supervised and controlled”. Regulators need to have a clear picture and record of the number of operators, scope and supply of services, operator assets and revenue streams in each jurisdiction. One of the main issues raised in the Communication is the fact that there is so little reliable information available on the online gambling industry. As Goudsmit explained: “there is still no audited and independent data available from online operators on their financial revenues, compliance with responsible gaming standards, money flows, etc. The EU will not be able to launch any coherent initiative without access to audited and independent data on the online gambling sector, which, as is emphasized in the European Parliament report on online gambling adopted in November 2011 and in this EC Communication, is currently so clearly lacking.” The ECA would like to encourage the Commission to launch a data research process to gather neutral and audited data. The ECA welcomes the fact that the Communication reiterates the subsidiarity principle. Given the specific associated health risks, gambling is an activity of a special nature, and the ECA stresses the need to control this activity with a view to ensuring the proper protection of consumers, particularly the most vulnerable ones, and to prevent money laundering activities. In this respect, the ECA also welcomes the announcement to consider broadening the scope of the Anti-Money Laundering Directive to include online gambling operators, since it currently only applies to land-based casinos. Since gambling is such a sensitive activity, the ECA urges the Commission to continue taking a step-by-step approach, thus allowing and providing the necessary time to exchange best practices, learn from each Member State’s experiences and base any upcoming initiatives on a thorough assessment of the market and regulatory realities. It is therefore crucial that the Member States are part of the policy shaping process both in their own right and through the European Parliament and Council. To this effect, the ECA applauds the EC’s action point to “establish an expert group on gambling, composed of representatives of Member States, to exchange experiences and good practices as well as to provide advice and expertise on the preparation of EU initiatives” in 2012. The ECA would like to congratulate the European Commission for deploying particular efforts in delivering this Communication and outlining the fundamental questions that have to be addressed. Moreover, the ECA welcomes the European Commission’s acknowledgement that online gambling is a global issue that requires an in depth analysis of the market realities and developments. The ECA will fully engage in the next EU policy steps and hopes that this Communication will lead to more legal certainty for all interested parties. Net Entertainment, the world’s leading provider of high quality casino games, is the proud sponsor of the IT-Geek of the year 2012. We are very pleased to announce the winner of the IT-Geek Award 2012 – Jesper Engström with his contributed project Northbound. Under a great ceremony at the event Talent Excellence Summit & Awards Jesper Engström received the prize from Net Entertainment’s CEO and President, Per Eriksson at the Marriott hotel in Stockholm on Thursday October 11th-2012. The number of gaming machines installed in the Italian public places starts increasing again. The new slots now into operation – according to data released by AAMS in the last hours and upgraded to the present week – are little more than 379 thousand by virtue of about 415 thousand authorisations to operate issued by the administration. The distribution of videolotteries starts again and now they arrive at a number of 45,277, which also exceeds the number of active terminals until a month ago, but that is increasing as regards the previous updating of 7 October 2012. Quixant is pleased to announce that it has added support for the popular Merkur MD100 Note Recycler from the Gauselmann Group, to its all-in-one gaming platform range. Quixant’s customers can now select the MD100 confident of full support through Quixant’s APIs and peripheral device driver library. The MD100 is an innovation in the banknote acceptors/recyclers sector and is already enjoys a significant installed base. The device is capable is capable of accepting and paying out the Euro, as well as all other European currencies and records its own statistics data. Paolo Ruscitti, Senior Embedded Software Engineer in Quixant’s software development centre in Rome, Italy said, “Adding support for the MD100 has been made very easy through the open and efficient support we received from the engineering team at Gauselmann”. Merkur Gaming had a major presence at the Global Gaming Expo (G2E) that took place at the Las Vegas Convention Center in Las Vegas, USA, between 2nd and 4th October. 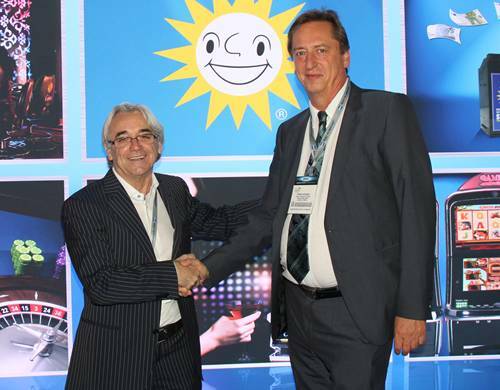 The continued international interest for gaming solutions from Merkur Gaming has rightly seen Merkur Gaming firmly increase its investment in global gaming exhibitions. 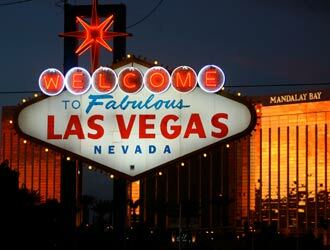 Thus, the stand size at the G2E was over 600m². Having one of the largest stands at this year’s G2E in Las Vegas sent out a clear message in the industry for Merkur Gaming’s long-term intent and focus on international gaming. As a member of the Gauselmann Group, Merkur Gaming places the right emphasis on its international strategy by creating local solutions to reflect local needs and standards. Recent examples at exhibitions in Latin America underline this with the much-loved Cantinflas figure featuring in games from Merkur Gaming. Even in smaller countries such as the Czech Republic, Merkur Gaming demonstrates its local focus. For example, Merkur Gaming presented three distinct games selections at the recent gaming exhibition there for three separate target markets. Here Merkur Gaming is bringing fresh input by also serving the North American market with a large variety of games. 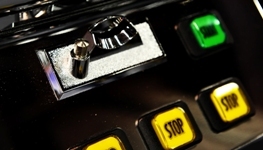 Merkur Gaming has extensive experience in the server-based and video lottery technologies. Thus, the VLT and SBG solutions had a dedicated, designated part of the Merkur stand for themselves. These VLT and SBG have been in operation already for several years in a multitude of markets. Naturally they are all approved according GLI-11 standards and so available for operators around the globe. The ‘made in Germany’ philosophy continues to win over operators throughout the world. The complete range of gaming cabinets, including the Highflyer, Privilege and Evolution, were on proud display at the G2E. Furthermore, the highly successful bill recycler – the Merkur Dispenser 100 – generated great interest as it can recycle and thus pay back three separate bill denominations with a capacity of 34 for each type, thus 102 in total. Two further sister-companies of Merkur Gaming within the Gauselmann Group partook on the stand: GeWeTe – the most successful manufacturer of change-giving solutions in Germany – and edict egaming – the provider of the revolutionary Online Casino System as a global innovation for the B2B market. Therefore, a whole world of gaming solutions was on display. Mr. Thomas Niehenke, COO of the Gauselmann Group, was very pleased with the feedback from the G2E, stating, “Our dedication to international gaming once again resulted in an excellent exhibition result. The fine combination of providing local solutions with ‘made in Germany’ technology makes us stand out more and more as the preferred gaming partner. Today we have over 8,000 employees within the Gauselmann Group, underlining that we are excellently positioned for further international growth”. Advantech-Innocore participation at G2E show in Las Vegas was extremely successful this year with achieving good awareness of the force the company now represents, being part of the world’s largest industrial PC manufacturer. Most potential- and existing customers now see the benefits of this large organization, in the areas of technology, service and sales. Koen Stomph, Advantech-Innocore Sales Director Gaming Europe said “Also our showing of a wide range of industrial displays was well received, a logical tie-up with the platform range people regard so well. The many confirmations from companies involved in ongoing projects that we are definitely the driving force was good to notice. It becomes clearer every day why Advantech is in that global no. 1 position; commitment and leading technology, available to the gaming industry in many forms”. Besides the wide range of products (one-stop-shop), the continuity of the Advantech-Innocore offer through the products has been a key message; State-of-the-art where needed, protected by longevity warranty and backward compatibility where expected and easily obtainable due to our truly global footprint. Koen Stomph pointed “2012 has been a good year for Advantech-Innocore when looking at new projects won and the pipeline growth following that. The last quarter of 2012 had been more difficult as expected, with some specific European markets decreasing or even closing. But we are confident ICE 2013 will have that good vibe again, indicating a positive turn of the European industry”. In 2013, Advantech-Innocore will continue to present itself as a key player, making sure everyone recognizes the benefits of the offer to the global gaming OEM’s, not only through products and services but also by bringing a matured and transparent eco-system to the customers. Quixant, the casino and gaming industry’s premier designer of all-in-one gaming platforms, enjoyed a hugely successful G2E 2012 show and was delighted with the number and depth of business opportunities. Quixant representatives were joined by several key individuals from AMD’s embedded team at the show, demonstrating the strong technology partnership between AMD and Quixant. Showcasing the QXi-4000 for the first time at a major trade show alongside the flagship QX-40 and established QXi-200, Quixant continues to push the boundaries of performance, feature-set and affordability of its gaming platform range. Also on demonstration at the stand were Quixant’s new DisplayPort monitors utilizing Multi Stream Transport (MST) technology to daisy-chain multiple HD displays from a single DisplayPort connector. Quixant showed this technology driving 10 independent screens from a single QX-40. 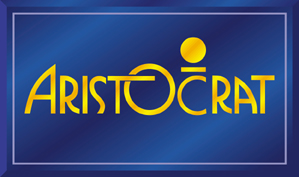 Aristocrat Technologies has joined forces with Monegasque state operator Monte-Carlo SBM to present a new gaming experience at the casino located within the luxurious Monte-Carlo Bay Hotel Resort. The installation features 84 Aristocrat slot games accounting for 63 per cent of the floor and includes five highly anticipated titles making their European debuts. The debuts include three VIRIDIAN Hybrid™ Steppers, ZORRO™ The Legend Returns – with 32-inch LCD Feature Top Box – and UltraSpin™ games Diamond Destiny™ and Ruby Saloon™. Also making their first appearance on the Continent are the licensed multi-play games The Phantom™ and Queen of the Nile™ Legends, the first in a series of proven Aristocrat titles enhanced with multi-game options. This development represents a significant step forward for Aristocrat’s European presence on several levels, explained Pedro De Matos, General Manager – EMEA. 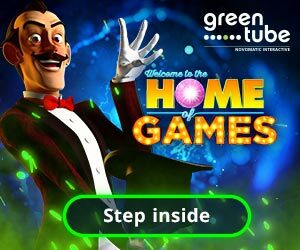 “The casino now hosts a broad selection of Aristocrat games, including the latest releases, our new VIRIDIAN Hybrid Steppers, the progressive linked jackpot Cashman Fever™, standalone bonusing and jackpot games and the Xtreme Mystery™ Jackpot solution,” said Mr De Matos. Monte-Carlo SBM Managing Director, Jean-Louis Masurel said, “This is a comprehensive agreement that will involve on-going support from Aristocrat to help maximise the player offering. In addition to fresh installations of new gaming experiences, we will work together to broaden the on and off-line marketing activities serving both existing and new player groups across the Côte d’Azur, Liguria, Piedmont, Lombardy and surrounding areas.